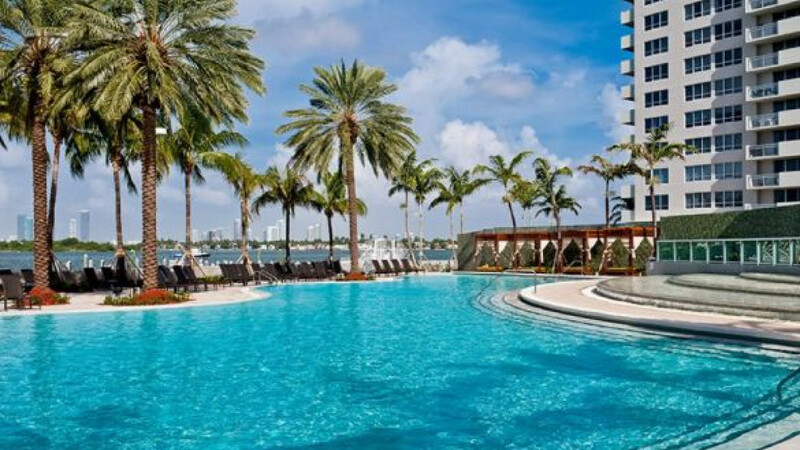 A pool at the Flamingo South Beach condominium complex in Miami where Navalny said Pekhtin owns a unit. United Russia co-founder Vladimir Pekhtin, who until last week had headed the State Duma's Credentials and Ethics Commission, relinquished his parliamentary seat Wednesday in an apparent opposition victory. "I will not allow unscrupulous political opponents to besmirch the reputation of United Russia," he told the Duma on Wednesday. "I am not keeping my seat because what's personal is secondary to the United Russia's interests." Anti-corruption blogger Alexei Navalny, a leader of the protest movement that swept Moscow's streets last year, released controversial evidence last week that Pekhtin purportedly co-owned undeclared property worth more than $2 million in Miami and Ormond Beach, Florida. Russian lawmakers are required to declare all their property and income. Last Wednesday, a day after Navalny posted the evidence on his blog, Pekhtin stepped down as chairman of the Credentials and Ethics Commission. The anonymous blogger who gave the evidence to Navalny told Vedomosti under the pseudonym Doctor Z that he had similarly compromising dirt on other lawmakers as well. In his blog post, Navalny said: "Pekhtin, together with his son, currently own apartments in Miami Beach, worth $540,900 and $1,275,000, as well as land with a house and pool in Ormond [Beach], which cost him more than $400,000." Pekhtin has several times changed his words about the Florida property. He first said he barely owned any property abroad, then said his son owned the property. He has maintained that the documents published by Navalny were misleading due to a difference in the registration of property in the U.S.
Navalny, who had sent requests to the Prosecutor General's Office and Duma Speaker Sergei Naryshkin to verify the evidence, said he was glad with Pekhtin's decision to resign but still wanted the case to be examined by the Duma's ethics commission. Many fellow lawmakers also supported Pekhtin's decision. Naryshkin, who chairs the State Duma, said it was an "honest and responsible move." The head of the Duma's United Russia faction, Vladimir Vasilyev, said Pekhtin would go to the U.S. to prove that he had no property there. "In order to defend his honor and dignity, Pekhtin has to prove his rightness in the U.S., which is difficult to combine with work in the Duma," Vice Speaker Sergei Zheleznyak said in comments posted on United Russia's website. Fellow Vice Speaker Vladimir Zhirinovsky, the outspoken leader of the Liberal Democratic Party, called Pekhtin's decision a fine gesture because it would leave the Duma out of any related scandal. But he said he thought Pekhtin was innocent. In a statement published on his party's website, he said that half of A Just Russia's deputies and a third of the Communist Party's deputies should follow Pekhtin's lead. "If we detect that someone in our party [doesn't declare his property], we demand that he quit as well," Zhirinovsky said. President Vladimir Putin recently introduced a bill seeking to prohibit officials from having bank accounts or owning stock abroad. But ownership of real estate overseas would still be allowed. "All the comments that Pekhtin is a hero are very funny," said Alexei Malashenko of the Carnegie Moscow Center. "It was the Kremlin's order for Pekhtin to resign in order to not set others up, as they understood that the scandal might reach Putin himself. Putin understood this, and that is why he started to sort out the situation." Other experts have called the revelations about Pekhtin a score for Navalny and the opposition blogosphere. They pointed out that in contrast to other corruption cases, like with former Defense Minister Anatoly Serdyukov, in Pekhtin's case the information came clearly from bloggers and opposition activists, not government sources. They emphasized the growing importance of public opinion in influencing politics. Sergei Neverov, deputy head of the United Russia faction, said that no one forced Pekhtin to resign from his post, but rather it was his own decision, Ekho Moskvy reported. He also said Pekhtin would be legally allowed to remain in the party, Russian News Service reported. Some political experts, though, held another opinion. Valery Khomyakov, head of the National Strategy Council, told Kommersant FM that it was the end of Pekhtin's political career. "We won't hear his name within the political framework anymore," he said. "The documents are real, the U.S. agencies dealing with property registration are unlikely to have altered the documents, so he's simply going to live in his Miami house." Many experts agreed that Pekhtin's decision to resign may be seen as the first step toward a greater victory for opposition bloggers and Pekhtin's exposure would push more deputies to resign soon for similar reasons. A few hours after Pekhtin's statement, another United Russia deputy, 60-year-old billionaire Anatoly Lomakin, who became a Duma deputy last August, announced his decision to quit the Duma due to health reasons. However, pundits said his resignation was linked to unlawful involvement in business. A day earlier, Vasily Tolstopyatov, also a United Russia member, quit the Duma after the opposition alleged that his income was suspiciously high. "Blogs may become one of the ways to revitalize our social political system because our police fails to implement its functions," said Pyotr Filippov, head of the Center for Studying Methods of Fighting Corruption. Messages about an opposition victory were splashed across the Internet. "This is it. The revolution will happen tomorrow or the day after tomorrow," user @sssmirnov wrote on Twitter. Dmitry Gudkov said on Twitter that Pekhtin's resignation was just a beginning and that it's likely to lead to the Duma's dissolution. "What if they all go to their foreign property? No need for a white-ribbon revolution then," lawyer Mark Feigin wrote on Twitter. Although Alexei Mukhin, head of the Center for Political Information, known for his pro-Kremlin remarks, denied that the episode was a victory for Navalny because the anti-corruption blogger was playing into Putin's hands. "Navalny works for Putin, who has decided to cleanse the government," Mukhin said, arguing that the current campaign to root out corruption had been thought up by the Kremlin before. Staff writer Nikolaus von Twickel contributed to this report.